If the opponents create a vertical stack, you should surround the stack as illustrated – this is also called the ‘scramble’ position (although in ‘scramble’, you usually transition to 1-to-1 defence after 1 pass). The 5 players guarding the stack are basically playing a 5v5 surrounding game. When an offensive player cuts out of the stack, a defender marks them tightly, and the other defenders communicate and reposition to account for the fact it’s now a 4v4 situation. This transition happens as soon as there is space between the offensive players, and the sandwiching/surrounding players in the 4v4 should continue to be ready to switch with the defender in the 1v1 – for example if the offensive player cuts deep for a few steps and then comes under. The faster the defence can reposition, the less chance the offence has to exploit holes in the sandwich. Avoid having two defensive players mark one cutting player, as this creates an unbalanced sandwiching situation (e.g. 3v4), which is a weakness for the defence. 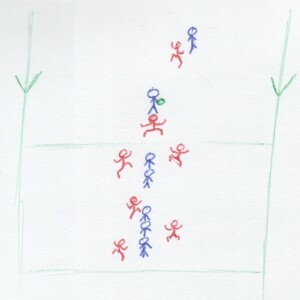 The players marking the stack can choose to split duties, for example from a 5v5 sandwich, into two sandwiches – 2v2 and 3v3. They might choose to do this in the case of a pre-existing imbalance, such as the offence having a few ‘superstar’ players, or when playing mixed gender ultimate. Against a horizontal stack from a central static disc, you should start tight to your mark, and look for switches after the first cuts are made. As any of the four cutting players can go deep initially, they must be marked honestly. Trying to have a deep & under poach when the disc is in the middle of the field does not work, as it leaves somebody in too much space – causing the defence to break down. If setting up in positions initially (not recommended), one wing player must push up to mark the third handler – the wing player on the break side. 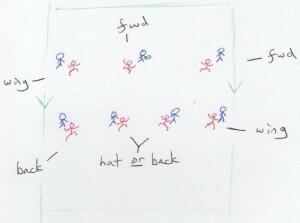 Make this move before the disc is in play if possible, so it’s clear to the back/hat players who you are marking. The side cutter on the break side is marked by a ‘back’ player, the side cutter on the open side is marked by the other ‘wing’ player, which leaves the two in the middle (the ‘active pair’ when the disc is in the middle). The back & hat players in the middle should mark honestly at first, as they don’t know whether they will go deep or come under, and it’s too easy to split the hat if we try to mark zonally. After the active middle pair make their first cut, the two defenders can get their heads up and have a look to see if they can switch. One defender will be ‘under’ – they can become the ‘hat’ – and the other will be ‘deep’ – they can become a ‘back’ player. As Horizontal stack utilises spacing between offensive players, switching rather than sandwiching is the more common way to gain defensive advantage. When the opponents transition into a vertical stack in the end zone, you should stay in Flex to stifle the space and generate confusion & chaos. The ‘Ant’ defence is particularly useful against a static start – if there has been a timeout after a huck caught just outside the end zone, for example. The force is straight up, and the remaining players surround the stack, picking up marks as they run towards them, and adjusting each time a defending team mate becomes occupied with a mark – like Flex vs Vert. 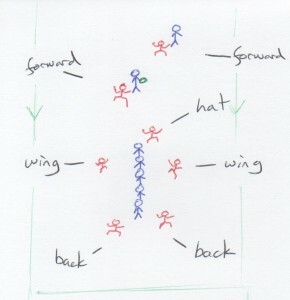 The ‘forward’ player marking the reset can also choose to leave them and join the ‘ant’ formation – which would give it six legs. If the person with the disc is a weaker thrower, the reset should be marked. In the video below, Felix talks about the roles of each position in Flex before talking about Flex vs Vert stack (11:48) and Flex vs Horizontal stack (15:10). Note this video is slightly outdated, as the emphasis of Flex has shifted away from positioning, and towards dynamic switching & sandwiching. Nice article Felix, it adds up quite well with the first flexagon defence article. Looking forward to do some Hex/Flex workshops and then implementing it in real games!